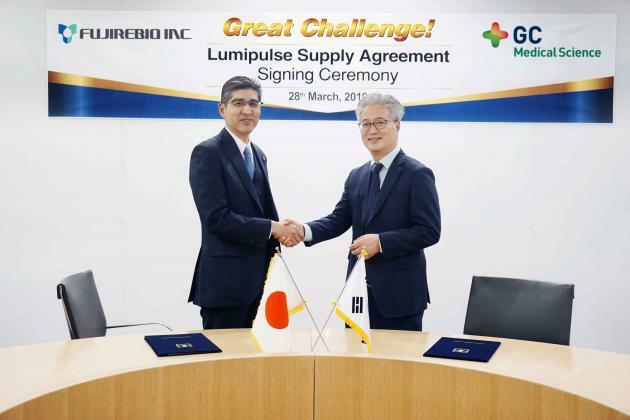 GC MS, a diagnostic kit and medical equipment maker, said Friday that it has signed a contract with Fujirebio, a Japanese medical device firm, to export its Lumipulse Series, the company immunoassay device line-up. GC MS CEO of Ahn Eun-uk (right) and Fujirebio Vice President Takashi Fujita shake hands after signing the supply contract at GC headquarters in Yongin, Gyeonggi Province, Thursday. The Lumipulse Series is a diagnostic device, which allows quick and accurate tests on a total of 30 diseases, including infectious diseases such as hepatitis and AIDS, as well as cancer, diabetes, thyroid and hormone tests. The device diagnoses these diseases by analyzing the antigen and antibody reaction with the blood of the patient. The Lumipulse Series consists of “Lumipulse G600 Ⅱ” and “Lumipulse1200” and can detect up to 60 and 120 diseases, respectively, per hour. The company said it expects to expand its market share in Japan by expanding sales channels to large hospitals as well as small- and medium-sized hospitals as it has successfully signed a contract to supply Fujirebio with two of its immunoassay analyzers for the first time among local companies. GC MS plans to continue to cooperate with Fujirebio to expand its immunoassay analyzer and various diagnostic systems in domestic and global markets.